After scoring six of Fort Wayne’s first 13 points, Indiana’s rookie, while matched up against the more imposing 7-foot-2, 254 pound frame of Jordan Bachynski, picked up two first quarter fouls and was forced to watch the final 4:30 minutes of the period from the bench. Christmas picked up his third personal with more than nine minutes remaining in the second quarter, effectively ending his involvement in the first half. He finished the night with five fouls. The undersized center from St. Croix can play stout defense against bigger bodies when he stays on the ground and resists the urge to be baited by shot fakes. Beyond foul trouble, here are a few more numbers you should know about No. 25’s recent play with the Mad Ants. 47.8: Field-goal percentage from mid-range during the month of February, the highest of any month this season. With March on the horizon, Christmas needs to prove he can string together multiple months of 40 percent or better shooting outside the paint, rather than being bogged down by fits and starts. As was explained here, the rookie’s ability to hone his shooting touch with the Mad Ants could be a game changer when it comes to earning a call-up. Due to his smaller stature, there are no guarantees that Christmas’ post-oriented game will translate to the NBA. Capable of utilizing his explosive first step to take opposing big men off the dribble, defenders tend to hang back in the paint and give the Syracuse alum plenty of room to line up his shot. His ability to consistently knock down those looks will not only force opponents to stay honest; it will make his size less of a liability and more of an asset. 3.0: The number of turnovers Christmas has averaged per game during the month of February, the most of any Mad Ant. 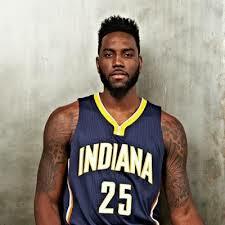 Once Indiana’s rookie was named D-League Performer of the Week in December and selected as a D-League All-Star, it was only natural that opponents would shift their attention toward him on defense. It doesn’t appear that the assignee has adjusted to this change, yet. •Starting Rakeem Christmas and Shayne Whittington in the front court, Fort Wayne’s starting lineup looks like the Blue & Gold’s, but the similarities stop there. The Mad Ants average over 100 possessions per 48 minutes (which ranks eighth in the NBA’s Developmental League) and still intermittently use the second-year Pacer to run 4-out offense. Over 30 percent of Whittington’s field-goal attempts during the month of February have come from behind the 3-point arc. •Whittington is still shooting below 35 percent from distance, but his average has, for the most part, trended slightly upward with each passing month he’s spent in Fort Wayne: November (25.0%), December (23.1%), January (32.0%), February (33.3%). • Paul George was in attendance at the D-League All-Star game to support Rakeem Christmas. Walter Lemon Jr. (26.0%), Anthony Harris (22.5%), Terran Petteway (22.1%), and John Lucas III (21.6%) are all posting higher usage percentages than Rakeem Christmas since the Mad Ants announced they had acquired John Lucas III on January 14. Shayne Whittington’s usage percentage is the seventh highest on the team over that same span of time. •After competing in the NBA D-League Finals the past two seasons, the Mad Ants (15-20) currently sit last in the Central Division and rank eighth in the Eastern Conference. Only the top four teams from each conference make the playoffs.